“If it was possible to describe music with words, we wouldn’t need instruments, we could just go out and talk about it.” The Swedish guitarist Johan Leijonhufvud is not the kind of musician who likes to talk about music. He just plays it. Ever since his several years of collaboration with the German star trumpeter Till Brönner, Johan is considered one of the most promising protagonists of contemporary jazz. 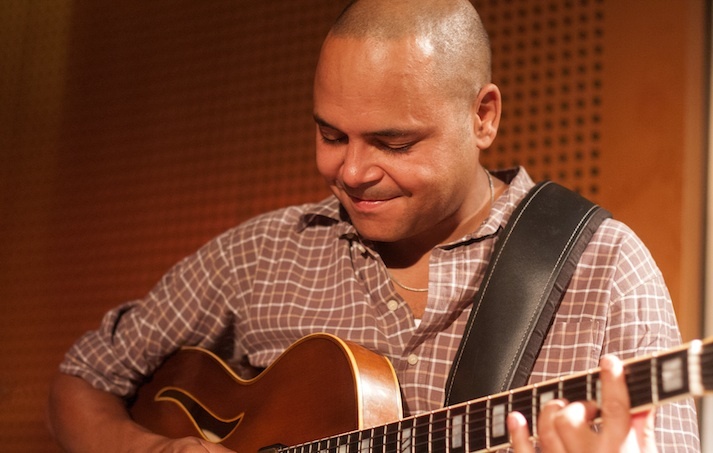 He has put his name on the list of first-class jazz guitarists, not only as a sideman of Brönner and Nils Landgren but also as a bandleader of his own projects, and has often been associated with the tradition of greats like Joe Pass, Kenny Burrell, Wes Montgomery or John Scofield​​. After three studio albums and a live CD in Sweden, Johan’s forthcoming album will be presented by the Berlin-based jazz label Blackbird Music. Together with Christian von der Goltz (p), Lars Gühlcke (b) and Tobias Backhaus (dr) he started his new project Johan Leijonhufvud Mighty Mezz. Their first release is simply called “Vol. 1”, a modern jazz album, versatile in style, pluralistic in the best sense. In the early nineties Johan Leijonhufvud was intensively working Malmö’s music scene, he organised sessions and linked up with other musicians. Ten years later he headed for Berlin, willing to explore the local jazz scene. He met Till Brönner and the later members of his quartet, first Christian von der Goltz and Lars Gühlke, and a few years later, Tobias Backhaus. Musically, Johan feels at home both in Malmö and in Berlin. Commuting between these two cities strongly influenced the soundscapes he combines in his compositions: The beautiful melancholy of Sweden meets the radiant variegation of the big city. It’s his special sound that makes Johan so unique. It’s his melodic and sparkling lines, his tone so full of cool elegance and breathtaking lightness, carried by the warm sound of his semi-acoustic. Yet his playing is passionate, rich and funky. There are not many musicians who are able to groove in such a relaxed and sophisticated way and create such an enthralling intensity at the same time. Johan Leijonhufvud finds his inspiration listening to the music of Miles Davis and John Coltrane or hiking through the stunning loneliness of the Swedish countryside. His creative process begins unintentionally and without specific reason. It’s rather a playful search on the guitar, a gathering of fragments that become a song in the end. It all starts with a single chord, a rhythm or a melody.